Torque Solution shifter pivot bushings replace the soft rubber worn out bushings that makes the shifter feel sloppy. 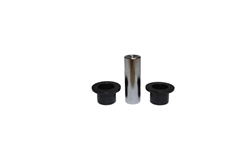 Get rid of the sloppy feeling and excessive play you notice in your shifter by using our Delrin bushings. These Delrin replacements will provide a much more direct feel when shifting, so you know when you go for each gear its going where it supposed to go.